Preheat oven to 325°. Spray 2-quart baking dish with cooking spray. Spread bread on rimmed baking pan; bake 10 minutes or until lightly toasted. In large skillet, cook bacon over medium-high heat 5 minutes or until crisp, stirring occasionally; with slotted spoon, transfer to paper towel-lined plate. To drippings in skillet, add tomatoes and mushrooms; cook 5 minutes or until tomatoes start to burst, stirring occasionally. Add garlic and kale; cook 1 minute, stirring occasionally. In large bowl, whisk eggs, milk, ¾ cup Parmesan cheese, ¼ cup Gouda cheese, oregano, salt and pepper. 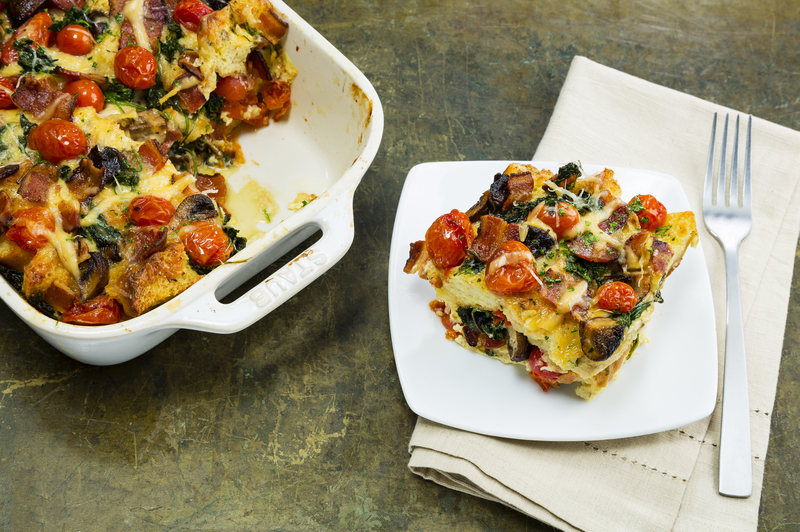 In separate large bowl, toss bread, bacon and tomato mixture; spread in prepared dish. Pour egg mixture over bread mixture; press down with back of large spoon to submerge in egg mixture. Bake 30 minutes; sprinkle with remaining ¼ cup each Parmesan and Gouda cheese. Bake 10 minutes or until internal temperature reaches 160°.